The American Le Mans Series and Pan-European broadcaster MotorsTV today announced the extension and expansion of a multi-year broadcasting rights agreement for MotorsTV to become the exclusive “live” television outlet for the Series in Europe through the 2008 season. The new agreement also includes Internet enhancements via shared endeavors between the Series’ official Web site (www.americanlemans.com) and Motorstv.com, substantial upgrades in MotorsTV’s promotion of the Series to its viewers (including a season-long watch and win promotional event) and mutual plans to develop additional American Le Mans Series programming opportunities to air on MotorsTV. MotorsTV currently reaches more than 45 million households in 30 European countries and broadcasts in English, French, German and Greek. On March 18, MotorsTV will feature 10.5 hours of “live” coverage of the 54th running of the Mobil 1 Twelve Hours of Sebring beginning at 15:00 Central European Time (CET). 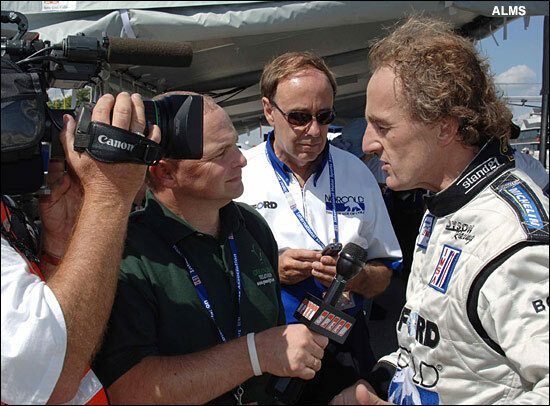 The satellite channel has earned its spurs with its unrivalled coverage of the ALMS during the previous two seasons – with British viewers either hearing the TV commentary direct from John Hindhaugh and co., or choosing to watch the superb TV coverage, while listening to Hindy’s coverage on the ALMS Radio Web / Globecast. “Sports car racing traces its roots to Europe, and we are proud to work with MotorsTV to deliver the world’s best manufacturers, teams, drivers and professional sports car racing to such a desirable audience,” continued Atherton. The driver in this image (James Weaver, below) recently compared an event like Sebring to “a five day test match” (that’s cricket, for non Brits). He suggested that 20 lap sprint races were comparable to a 20 over slog in cricket, “but we Brits like an event to develop over hours or days.” 12 hours at Sebring should be enough, even for James. Those on the eastern side of the Atlantic who are unable to make the trip to Sebring should make every effort to follow the event on MotorsTV - but you knew that anyway, didn't you?.